The European Union Flag was officially adopted on December 8th, 1955 and is a dark blue flag that features a circle that is made up of twelve, 5-pointed stars. 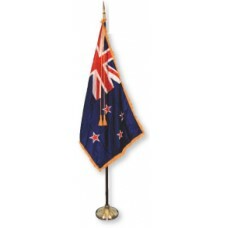 The twelve stars and the flag represent the various countries involved showing unity and harmony. 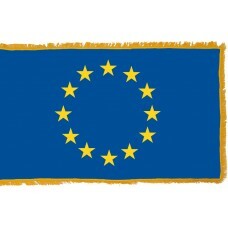 The council of Europe described the flag as: "gainst the blue sky of the Western World, the stars represent the peoples of Europe in a circle, a symbol of unity. Their number shall be invariably set at twelve, the symbol of completeness and perfection." 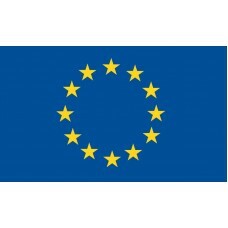 The European Union flag was designed in 1950, but not adopted until 1955. The European Union is the combination and harmony of 28 states located in Europe. It was initially formed following World War II, to put a stop to the wars that were occurring and to bring the countries together. In 1952, Germany, France, Italy, Belgium, the Netherlands, and Luxembourg came together and formed the European Coal and Steel community. This was formed under the "Schuman Declaration" (Robert Schuman) who's aim was to make it impossible for France and Germany to go to war again. The men responsible for forming the European Union are Robert Schuman, Akide De Gasperi, Jean Monnet, and Paul Henri Spaak. In 1957, another treaty was signed and named the "European Economic Community" (EEC). Slowly, over the years, more countries realised that this would also be beneficial to them and began to join. The 28 countries that are now part of the European Union are: Germany, France, Italy, Belgium, Netherlands, Luxembourg (1952), Denmark, Ireland, United Kingdom (1973), Greece (1981), Spain, Portugal (1986), Austria, Finland, Sweden (1995), Cyprus, Czech Republic, Estonia, Hungary, Latvia, Lithuania, Malta, Poland, Slovakia, Slovenia (2004), Bulgaria, Romania (2007), and Croatia (2013). Any European country is allowed to join the European Union, as long as certain criteria are met including agreeing to all the European Union rules, having the consent of the other EU member countries and having the consent of the citizens, which is normally done through voting. 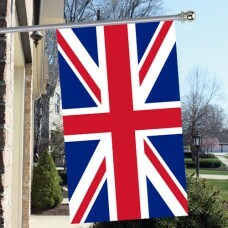 The United Kingdom are currently in the process of leaving The European Union, this "Brexit" will be complete by 2019. The European Union is now the world's largest economic area, with 19 of the European Union Countries adopting the Euro as their currency. Adopting the same currency makes the trading between the countries a lot easier. The countries that have chosen to adopt the "Euro" currency are collectively known as "The Eurozone." Today, there are over 500 million people in the European Union and citizens can enter the other European Union countries and are able to work, study or live there without the need of a permit or a visa. The countries within the European Union also strive to help each other in many aspects, such as politics, money, foreign affairs, justice and the economy.